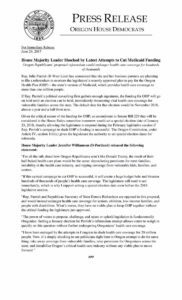 Home Elections Call to Action, Oregon Edition: Protect Medicaid and our Elections! Take a brief break from your fight against Trumpcare and the Republicans’ national agenda to focus on state politics for a moment. Local Republicans like Knute Buehler and Tim Knopp would have you believe they’re not like those partisans you see on TV in Washington DC. Well, we need them to take a stand and show it. We need you to call them on it! Last week, the Oregon state legislature passed a bill that would fix a revenue shortfall with the Oregon Health Plan – Oregon’s version of Medicaid. The bill will shore up OHP for two years with a health provider tax supplying $673 million. 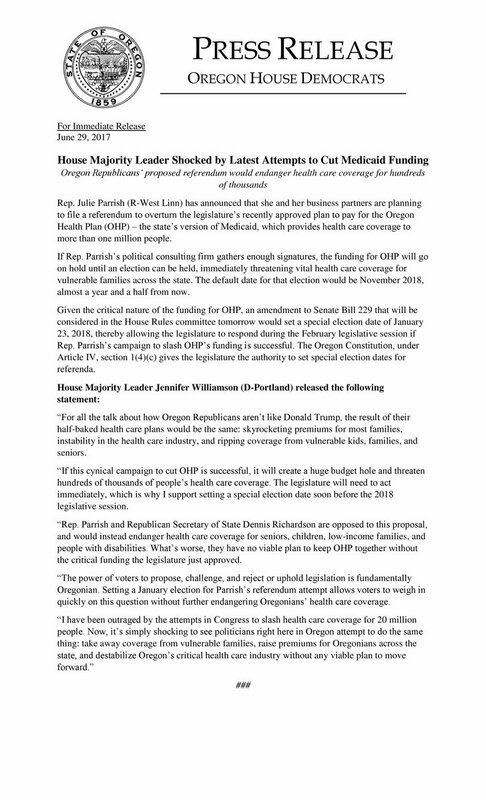 The bill passed with bipartisan support in the house and senate thanks to Republicans like Tim Ferrioli of John Day, who understands the importance of Medicaid to the clinics in his district that were able to expand under the ACA. We found a fix to a budget shortfall. So, what’s the problem? @hotcouponmama. No, really. Donald Trump isn’t the only conservative on twitter creating problems for healthcare. That’s state representative Julie Parrish from West Linn. She wants to repeal the tax that funds our Medicaid. Representative Parrish announced that she intends to use the consulting firm she runs to file paperwork to block implementation of the tax, potentially halting the budget fix for Medicaid and wreaking havoc on our healthcare system. Knute Buehler voted against the bipartisan bill that is being attacked by his party. He even wrote an editorial deflecting the issue with hazy talk of “reform” – a standard delay tactic for politicians who want to avoid accountability. Tim Knopp also voted against the bill and a quick google search shows that Gene Whisnant did too. Call your Oregon state legislators – wherever you live – and demand that they speak out against this attempt to derail our healthcare. We need solutions. Ask them what they will do if @hotcouponmama and her business partners are successful. Read the statement from Democratic Majority Leader Jennifer Williamson here. Voter suppression comes to Oregon? On the same day that Trump’s “travel ban” took effect, his “Election Integrity” team issued letters to election oversight agencies in each state demanding complete voter information – including your social security number, party affiliation, and voting history. The woman who ran the Department of Justice Civil Rights Division under President Obama called this letter “laying the groundwork for voter suppression” – read her comment and the full letter here. Will Oregon Republicans play along? 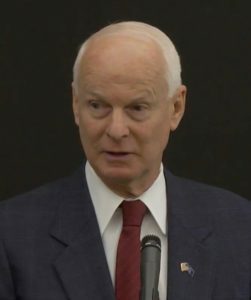 Elections in Oregon are overseen by Republican Secretary of State Dennis Richardson. Richardson has shown some resistance to the Trump agenda, but at other times displayed a willingness to seek out narratives to support his agenda – he is expected to run for governor, after all. In addition, Bend area legislators Knute Buehler and Tim Knopp are serving on an early redistricting committee formed by Richardson. The committee is looking at ways to reshape the map in Oregon elections. Whether they buy the Trump gang’s line about voter fraud and the necessity for a certain brand of “integrity” is vitally important to how they conduct their business. This demand by the Trump administration should be flatly rejected – just as the Secretary of State in Kentucky did. See her response here – no, really, it’s awesome! Call on the Oregon Secretary of State to stand for Oregonians – reject this unfounded demand by the Trump administration and denounce the claims of fraud that surround it. Call on Rep. Knute Buehler and Sen. Tim Knopp and ask them to do the same. We don’t need partisan meddling in our elections. Better yet, contact your favorite local news outlet on these issues too! Let the media know these are issues you care about and that you would like to hear official comment from our local elected officials on such vital topics. Health care, State legislature. Bookmark.